Folks, is there any way to fix the fact that the first chart up here is current (i.e. today's), rather than as it was on 4/4/06 when carled posted it, and when brian commented on the "outlying blue line"? So I guess that's a 2 part question: is there anywhere to get the 00z from 04/04/2006? can an admin swap it in for the one that's there? awf, no (and therefore, no). There is a new snow accumulationl chart from the German Met Office. This will give a good indication of snow for next 72 hrs at 10km horizontal resolution. select 3h-neuschnee and gesamt-neuschnee (which are 3hr snow accumulation and total accumulation from the model start time(normally last midnight or midday)) Note that the scales are NOT the same and are in cm. 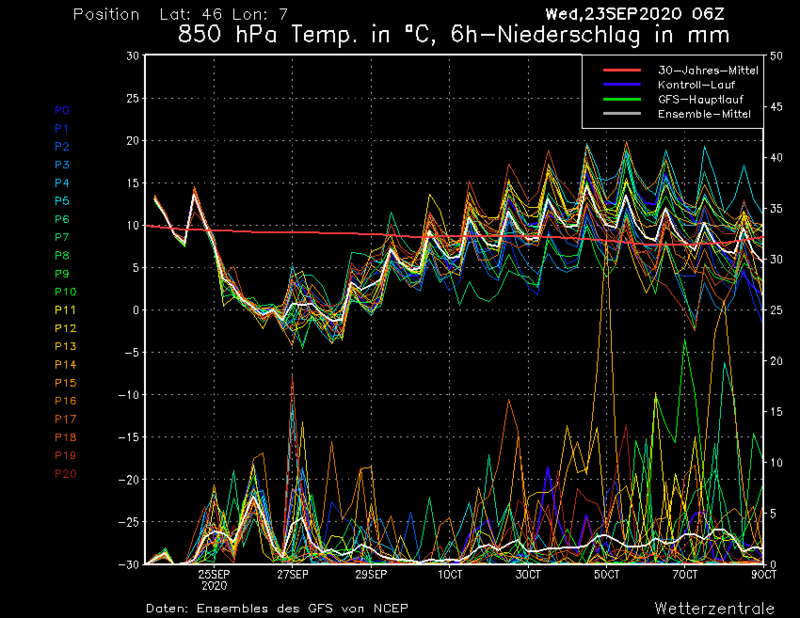 My last look has over a meter of snow in the next 3 days for parts of Switzerland. Why does - as seems to be the case currently, by several degrees - the GFS thick green temperature line often not line up with the other models, even when the correlation of the other models is extremely tight. And I don't mean fantasy island, i mean the prediction for later today! Well to my inexpert eye it looks as though all bets are off after the 12th. You could read whatever you want into those ensembles. The ensembles rarely seem to show trends that would appear to show the expected (by me) variation between day and night. Is there a reason or is the differentiation there and just not as obvious as I'd expect? ishay, I would have said in most of the graphs it DOES indicate day vs night. Maybe it's more prominent in the non winter days? Hmmm, well yeah it certainly looks like it on that chart! 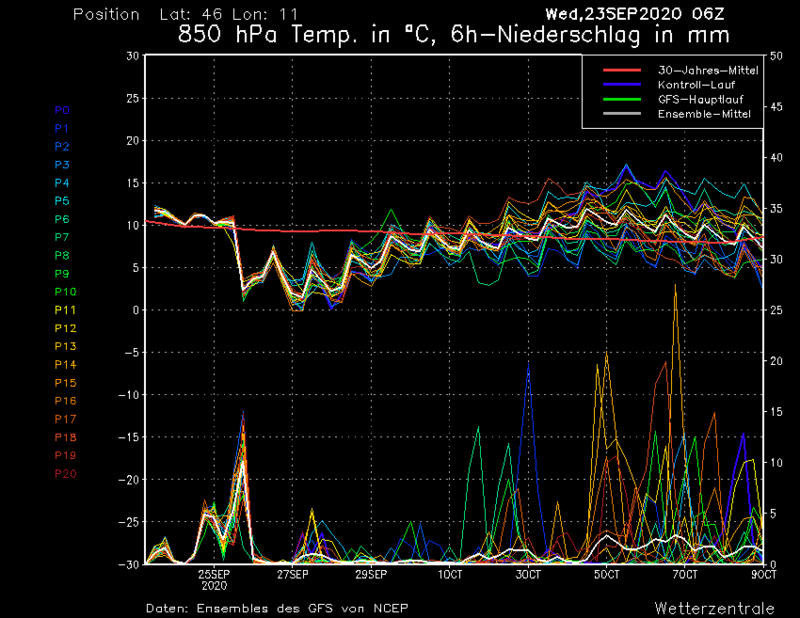 Some basic stuff at http://www.meteoexploration.com/information.php they also show the actual GFS maps and ensembles. The TWO spin off site IcyBlasts now offers 16 day probability forecasts in addition to the deterministic ones. My view is these provide a better guide to the medium term weather prospects despite these being set at regional rather than resort level. 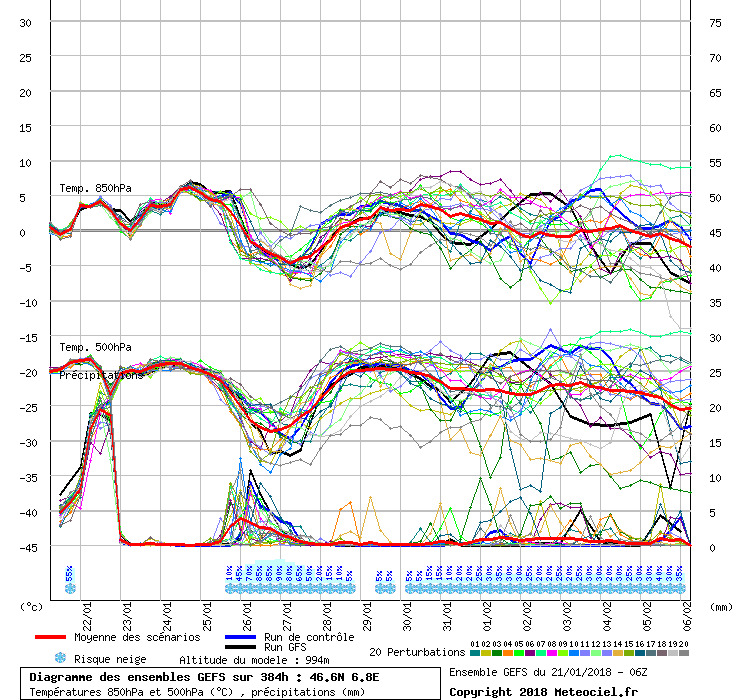 The plots shows 850hPa temperatures, precipitation amounts, the 'snow row' (number of runs in the suite forecasting snow) and the surface level temperature spread. I am, on the whole, a not too dim bloke, but the GFS charts are leaving me totally dark? Are the wiggly lines across the centre the 'ensemble'; being a collection of available chicken-bone predictions? Do we snowies get excited when they are close to being a fat corridor across the page, rather than a spider's web all disagreeing? If yes-ish (well done me!)... what's the bottom row of lines telling me? And what are the 'P' numbers on the y axis? I have tried to follow the explanations, honest! top set of wigglies are various predictions for temperature, with the white one being the 'ensemble' and the red the 30yr ave. The closer the lines, the more the various models agree - so generally close together in the next few days, getting less agreement the further out. P stands for Precipitation , and aren't relevant to the graphs - they're for the maps. Both are Interactive Weather Forecasts that show forecasts for GFS, GEM, EC. Lots of things to play with for those who don't wish to use ensembles or other maps or as a companion to these. Enjoy. Now no longer available.... sorry! If I can I'll find an easy alternative for you all. Is it the live links that were most useful or the point in time grabs? @admin this thread is moribund and needs to be set free to enjoy its drift into sH memories, despite Olaa90's verbose input. Still lots of good info in this thread. Leave it as a sticky please. AH! Finally! Thank you First time a post on this thread has made sense to me, despite trying and failing to decipher the graphs multiple times. Now that I can read the charts - where do I get them for a particular place? www.netweather.tv - lots of info, charts and a helpful forum been snow watching on there for years!